I don’t see how this could work. Also, it’s ugly. The knuckles fold up to the right to make the handle, and then there’s a little trigger that folds down. Also it seems to have a knife as well. Awesome. @dieAntagonista: Well, of course, there’s no point in having a brawl if your weapons aren’t pretty. That would be entirely unfashionable. ok, im understanding the knife and brass knuckles…but does it actually shoot? even when its folded down, i really dont see how this shoots…are the bullets out of the gun pretty much after they leave the cylinder? theres no barrel at all! so, it takes a weapon that already has poor accuracy and makes it worse? i dont understand! @LukeV1-5: I’m not having any brawls, I look at pictures. Aesthetics is what I judge. I’d say if you’re close enough to use brass knuckles or a knife, the accuracy of the gun is the last thing you’d be worried about. @compasseagle89: Thats an extremely good and fair point, but I dont think this thing would be so inaccurate that you cant hit another human 5 – 10 feet away with 6 separate shots. Assuming you dont have bad aim. But if you miss with all the shots you always have a knife and brass knuckles to back you up. But the cylinder which your hand folds around to use the knuckle is very hot from the shot. 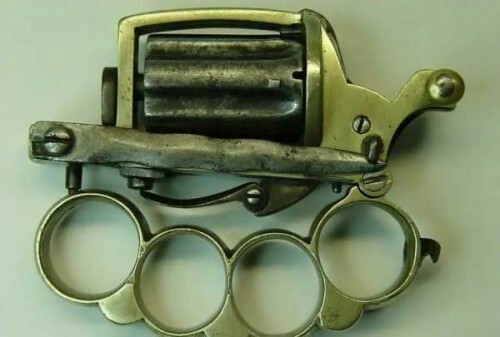 I would invert the knuckle to punch with the cylinder, plus it would fit the fingers better for shooting. Your attacker would have you bludgeoned to death by the time you fired that enough to heat it up hot enough to burn you. Ha, I can also see that thing going off in your face when you try to fold the trigger down. Bit of a design flaw there.